Open Access (OA) seeks to return scholarly publishing to its original purpose: to spread knowledge and allow that knowledge to be built upon. Price barriers should not prevent students, researchers (or anyone) from getting access to research they need. Open Access, and the open availability and searchability of scholarly research that it entails, will have a significant positive impact on everything from education to the practice of medicine to the ability of entrepreneurs to innovate. There will be High Tea at 5.30 pm. Please join us! 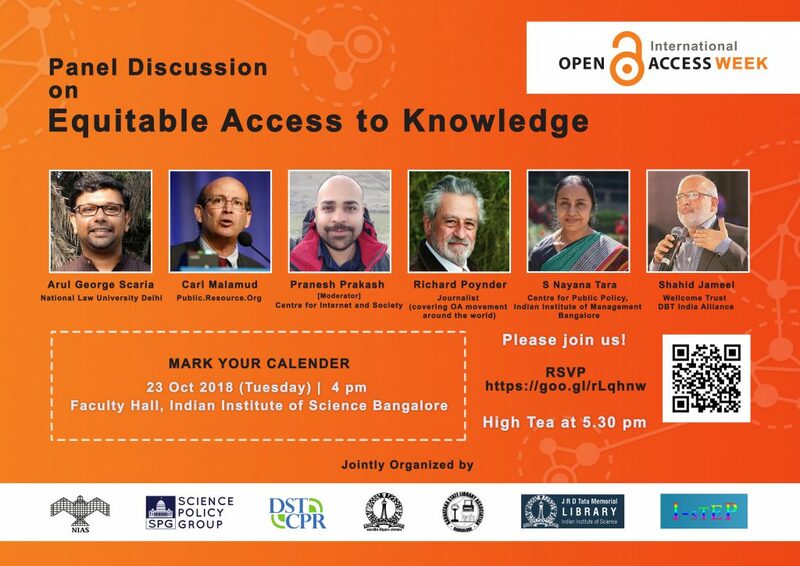 This event is a part of International Open Access week activities planned at IISc Bangalore, organized by DST-Centre for Policy Research at IISc in association with National Institute of Advanced Studies (NIAS), Karnataka State Library Association (KALA), JRD Tata Memorial Library, Science Policy Group (SPG) and International Scientific and Technological Education Program (i-STEP). International Open Access Week (October 22-28, 2018) is a global, community-driven week of action to open up access to research. The event is celebrated by individuals, institutions and organizations across the world, and its organization is led by a global advisory committee. This is an important opportunity to catalyze new conversations, create connections across and between communities that can facilitate this co-design, and advance progress to build more equitable foundations for opening knowledge. The official hashtag of Open Access Week is #OAweek.